Students, workers and faculty are striking today and tomorrow in protest of massive tuition hikes, wage freezes and lack of diversity at IU. Indiana students rally outside of Franklin Hall. (Courtesy of Matthew Bloom). Hannah Smith, an undergraduate student reporter for the Indiana Daily Student, filed this report today on the on-going strike actions taking place today and tomorrow at Indiana University, Bloomington. Follow @idsnews to keep up with paper's invaluable reporting on the strike and other campus and community issues. The doors to Ballantine Hall were pushed open, and shouts of "Raise Hell, not tuition!" echoed through the halls. Students came to the doorways of classrooms to watch as nearly 250 participants in IU on Strike reached one of the last stops on their march across campus to protest tuition hikes, wage freezes and lack of diversity at IU, among other things. Strikers congregated at the red clock tower behind Woodburn Hall at 10:30 a.m. and began marching at 11 a.m. Strikers wore red patches of felt pinned to their chests to show "solidarity for the struggle of students around the country." Half a dozen IU Police Department officers followed behind the strikers on bike. 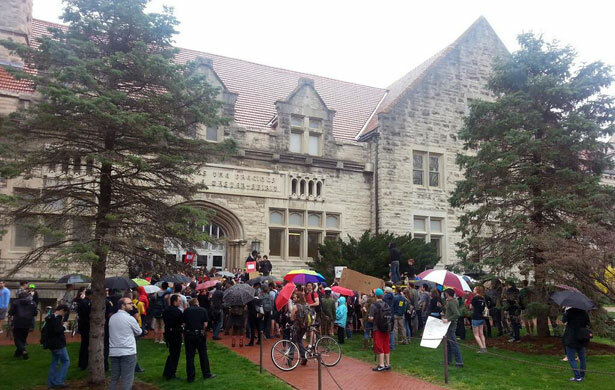 The strikers marched behind the Indiana Memorial Union, past the Chemistry Building, into the old Crescent, and then back to Ballantine, where they then flooded the second floor and called out for IU students currently in class to join them. Along the marching route, students hung out of windows in classrooms in buildings above to cheer on the strikers. The march will end where it began, at 12:30 p.m. at Woodburn Hall after a stop at the School of Education at 11:30 a.m.. At 1 p.m., they will be marching to the Board of Trustees meeting, followed by a "block party" at 2:30 p.m. on Forrest Avenue between Ballantine and Woodburn. Get up to speed on this action with our article "What You Need to Know About the Indiana University Strike."